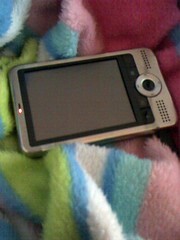 My new PDA, originally uploaded by sea-fae. I don’t think I will ever learn to be financially responsible. This past year I’ve been using a Dell Axim v3 that Joe got from a co-worker. It worked fine except for the little issue of randomly crackling and then not responding until reset. A few months ago this started happening every time I tried to use it so it became pretty much unusable. Last week I started looking around online at different PDAs (they seem to be losing popularity to the PDA phones) and came across the Asus MyPal A626. I used to use ‘626’ as part of some of my logins so I thought that was pretty nifty. I found the PDA on the Dell site, where they offer that credit line “Pay only $9 a month!” thing. I completely did not expect to get approved since my credit has taken a huge hit this past year. But…I did. And I bought. This was a bad, bad, thing since we struggle to pay the bills each month and have other things that we really need to get done (such as vet visits). But I really really wanted it and am in the midst of seasonal affective disorder-related depression and even though I should know by now that buying things only makes me momentarily happy…well you know the result. But I love it! And quite frankly at this point, I’ll take momentary happiness over none at all. I know what you mean, I go shopping when the weather gets crummy, too. And I also don’t need to be doing it!